SONOMA, Calif. -- Kevin Harvick made his NASCAR K&N Pro Series West return and he delivered. 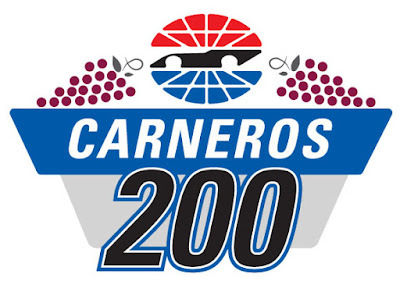 The Bakersfield, California, native dominated the Carneros 200 at Sonoma Raceway. Harvick held off hard-charging Sunoco Rookie of the Year contender in Will Rodgers, while the rest of the field was more than nine seconds back. Harvick won the 1998 West championship on his way up the NASCAR ladder, which culminated in winning the 2014 Monster Energy NASCAR Cup Series championship. He drove the No. 4 Fields Ford for Jefferson Pitts Racing to his eighth victory of his career in the K&N Pro West Series. "It always feels good to win no matter what it is," said Harvick. "The main objective was to come have fun, shine a little light on the series and shine a little light on how much talent is in the series. This particular series did a lot for me and to come back and be a part of it, see the health of it and see the young guys racing was the main objective. "It's always fun to race in front of your home state fans. It's been a long time since I raced in this particular series here, so it was a fun weekend." Rodgers, a 22-year-old from Murrieta, California, won his first Coors Light Pole Award earlier in the day and brought his No. 7 Solvang Brewing Company Ford home in second place, his best finish of his 14 K&N Pro Series West starts. "For some funny reason, I had a feeling as far back as four weeks ago that it was going to be me and Kevin coming into turn 11 on the last lap," Rodgers said. "And sure enough, there we were. He ran a really good race, I learned a lot from him. We were able to lead some laps there in the beginning. It doesn’t feel too bad to finish second today." David Mayhew came home in third, followed by Michael Self and Derek Kraus in fourth and fifth, respectively. Championship points leader Todd Gilliland, Blaine Perkins, Todd Souza, Sheldon Creed, Chris Eggleston and Monster Energy NASCAR Cup driver Daniel Suarez rounded out the top 10. Gilliland leads Eggleston by 11 points. Kraus is third (56 behind Gilliland), while Rodgers is 12 points back of Kraus in fourth. The Carneros 200 will air on NBCSN on Thursday, June 29 at 11 p.m. ET. The NASCAR K&N Pro Series West will return to the track on July 28 for the annual combination race with the K&N Pro East at Iowa Speedway. 1. (6) Kevin Harvick, Charlotte, NC, Chevrolet, 64 laps, 59.368 mph. 2. (1) Will Rodgers, Solvang, Calif., Ford, 64. 3. (5) David Mayhew, Atascadero, CA, Chevrolet, 64. 4. (2) Michael Self, Park City, UT, Ford, 64. 5. (16) Derek Kraus, Stratford, Wis., Toyota, 64. 6. (8) Todd Gilliland, Sherrils Ford, N.C., Toyota, 64. 7. (14) Blaine Perkins, Bakersfield, Calif., Chevrolet, 64. 8. (11) Todd Souza, Watsonville, Calif., Toyota, 64. 9. (15) Sheldon Creed, El Cajon, Calif., Ford, 64. 10. (9) Chris Eggleston, Erie, Colo., Toyota, 64. 11. (7) Daniel Suarez, Monterrey, Mexico, Toyota, 64. 12. (20) Carlos Vieira, Atwater, Calif., Chevrolet, 64. 13. (19) Tim Spurgeon, Danville, CA, Chevrolet, 64. 14. (25) Matt Levin, Tucson, Ariz., Chevrolet, 64. 15. (24) Kody Vanderwal, LaSalle, Colo, Ford, 64. 16. (23) Scott Ivie, Mountain View, Calif., Toyota, 64. 17. (17) Dave Smith, Novato, Calif., Chevrolet, 64. 18. (13) Johnny Borneman, Ramona, CA, Ford, 64. 19. (31) Rodd Kneeland, Sonoma, Calif., Chevrolet, 64. 20. (18) Will Gallaher, Santa Rosa, Calif, Toyota, 64. 21. (26) Takuma Koga, Nagoya, Japan, Chevrolet, 63. 22. (27) Ron Norman, Tucson, Ariz., Chevrolet, 63. 23. (10) Julia Landauer, New York, N.Y., Ford, 63. 24. (22) Stafford Smith, Eagle, Idaho., Chevrolet, 60. 25. (29) Nicole Behar, Spokane, WA, Chevrolet, 55. 26. (3) Ryan Blaney, High Point, NC, Ford, 53, rear end. 27. (21) Rich DeLong III, Santa Clarita, Calif., Chevrolet, 38, transmission. 28. (4) Derek Thorn, Lakeport, CA, Toyota, 22, engine. 29. (30) John Wood, Eagle, ID, Ford, 16, drive line. 30. (12) Jim Inglebright, Fairfield, Calif., Chevrolet, 10, electrical. 31. (28) Jesse Iwuji, Carrolton, Texas, Chevrolet, 8, oil line. 32. (32) Kevin O'Connell, Newport, Calif, Chevrolet, 0, did not start. Caution Flags: 6 for 20 laps. Lead Changes: 2 among 3 drivers. Lap Leaders: W. Rodgers 1-26; M. Self 27-41; K. Harvick 42-64. 286; 5. M. Self, 272; 6. K. Vanderwal, 272; 7. T. Souza, 266; 8. B. Perkins, 261; 9. N. Behar, 258; 10. M. Levin, 258. Turning heads, the North State Modified Series driver Sierra Furia finally has broke the bad luck chain. Furia had a rough start to her season in 2016 and was feeling a bit nervous about 2017 season. She started racing Modifieds when she was 16 years old at her local track Lakeport Speedway and has been racing this division since. "We have had a lot of success but then we have also had rough seasons. The 2016 season was one of the hardest race seasons I think I have experienced. We came out with a brand new car and started with a new series, I just struggled to adjust". Furia will be entering the fifth race of the season sitting 6th in points with the North State Modified Series. With a little bit of a rough start, Furia is looking forward to making further steps with the modified division. "We struggled a lot the first two races and it hit everyone super hard. We all have put in countless hours trying to turn our luck around and we just could not break out of the top 10 finishes." Furia went into the third race with large changes to her car with hopes that this would make a huge turnaround. Sadly, that morning they were heading to Redwood Acres, the family had received a heart-wrenching phone call with the news that a family friend had passed away. "I did not except the phone call, nor did I expect someone to be taken so soon. At the time of the call, I had every intention to stay home with my cousin and family to mourn the loss of Cristian Macias but I had to go race for him, I just had too. I went into the weekend with high hopes that it would work out and we would make progress, thankfully we did. I ended up 3rd in time trials, and finished 3rd in the main event. This was our first time finished above 6th with this series and made history with the series as I was the first female to finish top 3 with them. Overall, the changes made helped me as a driver and also helped the car." Madera Speedway has been one of Sierra Furia's toughest tracks, and that was the next race for her. Furia was top of the board all night Friday practice and made the decision to run with the Lucas Oil Modified Series after they put Hoosier tires on, where Furia ended up being 13th with the series at the end of practice. Furia ended up qualifying 4th with North State and tied 18th with Lucas Oil where she had to run the B main with them. Furia struggled to make the decision to race the B main or sit it out, to get the car ready for the North State main event. The decision was made and they transferred into the A main. Furia started the pole of the North State main and fell back to 4th where she ran until lap 27, when she got into it with another driver, sending her into the wall. Sadly, Furia had too much damage to continue and had to sit in the infield until the last lap of the main. "I had every intention to go out and win this race. Bad luck struck again but we got back out there to run the Lucas Oil main. Although we only were able to run 8 laps with them, we still made the show and ran with them. I really wish luck would have just would have been on our side because potentially we would have finished top 3 again." With this weekend being the fifth race of the season at All American Speedway, Furia has the mind set to turn the luck around again. With Redwood Acres Raceway being the best finish for Furia, she has every intention to top that finish and go for the win. "We have every thing in the right spot to win this weekend. The car has been the best it ever has been, the crew is working extra hard, and we are doing everything to pull off this well-deserved win. It has been great to be able to run upfront again since the 2016 season, and it feels good to be back in business. I can not thank everyone enough for the support, and help the past few months. I also can not thank my sponsors enough for supporting us every weekend on and off the track." You can find the rest of Sierra Furia's racing schedule on the North State Modified's website or Sierra Furia's Racing page on Facebook. Roseburg, OR (June 17, 2017) The past couple months have been a whirlwind of excitement for Brittney Zamora. She turned eighteen, graduated from high school with International Baccalaureate honors, and in the same day made an awesome showing with the Northwest Super Late Model Series, Inc. (NWSLMS) at South Sound Speedway, earning her the top spot in the championship point’s standings. 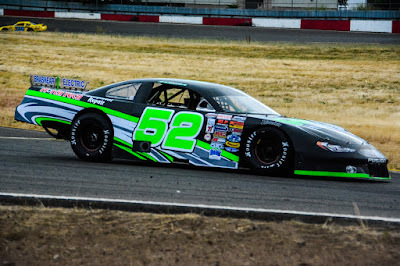 To back that up, this past weekend at Douglas County Speedway in Roseburg, Oregon, Zamora broke a 3-year old track record in qualifying, and won the Home Insulation of Roseburg 125, for her first super late model feature event breaking records for the northwest. Zamora became the first female touring super late model series division point’s leader and feature winner. As the fast qualifier on the 4/10th track, Zamora rolled the invert at six cars. Riley Watson and Jan Evans would lead the field to green. From her sixth starting position, Zamora thrilled the fans and took over the lead by lap 20 on her way to her first super late model win. An emotional Zamora stood in victory circle with her proud dad, Mike and mom, Tobi on the phone. Zamora had nearly a two second margin of victory over Umpqua, Oregon’s, Brandon Ash. Ash, the former track record holder and DCS champion, has raced in the NASCAR Winston West division, as well as having several starts in what is now the NASCAR Monster Energy Cup. Quincy, Washington’s Mitch Kleyn finished third. Kleyn is in hot pursuit of Zamora in the point’s chase. Jan Evans of East Wenatchee, WA finished fourth, and Pete Harding making the long haul from Langley, B.C., Canada rounded out the top five. Riley Watson and Jan Evans brought the field to green, with Watson taking the early lead. A spin by Brooke Schimmel and Mike Sackett brought out the first caution flag. On the restart, Watson drove in deep and got into the side of Jan Evans forcing him to second place. Jan Evans gave Watson a tap to let him know he didn’t appreciate it, and the two of them ended up spinning, along with Stephanie Evans who was trying to avoid them, which brought out the second caution. Alan Cress and Harding led the field to green with Zamora right behind. Cress took the lead as Zamora got by Harding. Zamora looked inside of Cress to take the lead, never looking back. Eureka, CA (June 18, 2017) – Outlaw karting action returned to Redwood Acres Raceway this past weekend for the third event of the season. Six divisions took to the 1/10th-mile dirt oval on what proved to be an exciting night of action. Charles French set fast time in Beginner Box Stock qualifying with an 11.418. T.J. Sorrels was in familiar territory as he won the trophy dash. Emma Hudman took the first heat win while Sorrels won the second. Kai McCrady-Hirsch and Madison Donovan brought the field to the green in the 20-lap main event. McCrady-Hirsch led lap one but was passed by Timmy Walters on lap two. Walters held on to the top spot until lap six when Sorrels took over. Janice Walters continues to show improvement with each race and she held down the second spot for the majority of the event until getting passed in the final handful of laps by Charles French. At the finish it was Sorrels winning over French, Timmy Walters, Hudman and Janice Walters. The UAS karts were in action for the night. Larry Fuller took the win in the trophy dash while Sean Fuller was the heat race winner. Kenny Boardman led the first eight laps of the 15-lap main event but Larry Fuller was able to take the lead and the victory. Steve Rambo was fasted in the Speedway/Old Fart division with a time of 11.846. Brionna Fuller took the win in the trophy dash while Wayne Fisher took the heat race victory. Robbie Robinson and Ryan Ahrens brought the field to the green in the 20-lap main event. Ahrens took the advantage at the start and had a spirited duel with Wayne Fisher for the lead between laps six and nine. A caution flag bunched the field on lap 14. Under the yellow, Fisher’s kart died and had to be restarted by track officials. Because of this, Fisher was forced to restart at the rear of the field which gave Ahrens the lead. Rambo was Ahrens’ toughest competitor in the final few laps but spun on the last lap. At the finish it was Ahrens winning over Lori Fuller, Jeff Smith, Wayne Fisher and Brandon Fisher. 15 Williamson Financial Group Box Stocks took time on the night and Dryver Dothage was fastest with a 10.903. Dothage was victorious in the trophy dash. In the heat races, Dothage and Jeremiah Boldway were winners. The 20-lap main event might have been the most competitive race on the dirt since the outlaw karts started racing at Redwood Acres Raceway in 2016. Boldway was strong, leading the first nine laps. A fantastic duel ensued between Boldway, Kasey Simmons and Dothage. Simmons led lap 10, Dothage lap 11 and Simmons lap 12 and 13. Dothage took the lead on lap 14 and looked primed to take the feature win. Dothage made a rare error on lap 17 as he spun out of the lead off turn two. Boldway took over. He was able to hold on and take the win over Simmons by a little over one second.Malessa Miles was a close third while Derek Kessler and Sophia Bauer rounded out the top five finishers. Qualifying for the 200 karts was paced by Anissa Curtice with a 9.839 lap. Landen Green was the winner of the trophy dash while the heat race was won by Curtice. In the 30-lap main, Curtice was dominant. She took the lead on lap one and never looked back. At the finish, her margin of victory over second place, Katie Carr was three laps. MKinzey Uselton took third while Green was fourth. Curtice was also racing her 500 kart on the night and just as in the 250s, she set fast time with a 9.639. Kenny Boardman took trophy dash honors while Tony Miles won the heat race. Boardman led the opening 10 laps of the 30-lap main but fell out of the race giving the lead to Curtice. Miles proved to be Curtice’s closest challenger but clutch issues forced him out of the race on lap 15. Curtice went on to take another main event victory on the night, beating Dax Williamson by nearly a full lap. Miles was credited with third followed by Boardman and Chelsea Champagne. DAYTONA BEACH, Fla. — All roads eventually wind their way back home. For three Monster Energy NASCAR Cup Series drivers this weekend, it’s a road course that turns back towards where it all began: the NASCAR K&N Pro Series West. NASCAR’s top developmental series heads to Sonoma Raceway in Sonoma, California, for the Carneros 200 on Saturday. The 1998 K&N Pro Series West champion, Kevin Harvick, will join recent first-time Monster Energy NASCAR Cup Series winner Ryan Blaney and current Monster Energy Series rookie Daniel Suarez in the field for the Carneros 200. All three drivers began their respective NASCAR careers at the K&N Pro Series level. Harvick, the 2014 Monster Energy NASCAR Cup Series champion, won at Sonoma during his K&N Pro Series West title-winning season. Suarez, a NASCAR XFINITY Series and NASCAR Mexico Series champion, has three career K&N Pro Series East wins to his credit, while Blaney — who recently won at Pocono — won his only career K&N Pro Series West start at Arizona’s Phoenix International Raceway in 2011. Others to showcase their abilities on Saturday, includes current series points leader Todd Gilliland and his Bill McAnally Racing teammate Chris Eggleston, who sits second in the standings. Gilliland and Eggleston have combined to win all seven of the series’ races this season and both will be looking to redeem themselves after a rough 2016 Carneros 200 showing. Heading into Sonoma, Eggleston has won two straight races to close his deficit in the championship standings to just seven points at the midway point of the season. EVENT SCHEDULE: Friday, June 23 – Garage opens: 10:45 a.m.; Practice: 2-3:20 p.m.; Driver Autograph Session: 4-4:45 p.m. Saturday, June 24 — Qualifying: 10:15 a.m.; Carneros 200: 1:30 p.m. 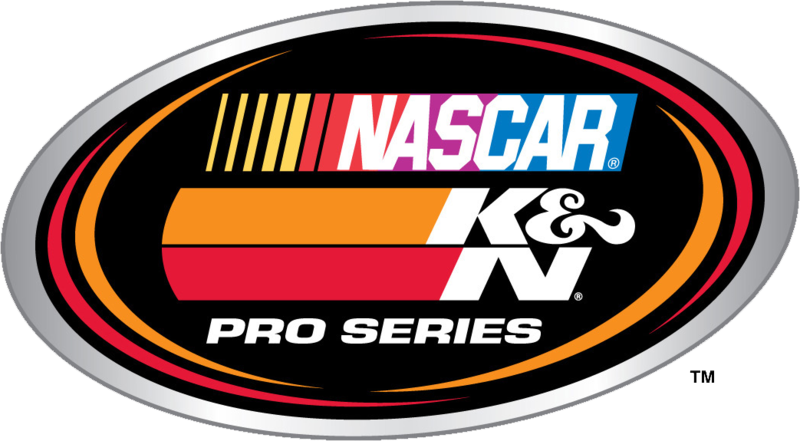 The Race: The Carneros 200 will be the eighth of 14 races on the 2017 NASCAR K&N Pro Series West schedule. The Procedure: The maximum starting field is 40 cars. The first 36 starting positions will be set by NASCAR Road Race-style group qualifying and the final four positions will be determined by the provisional process. The race is scheduled for 64 laps (204.966 kilometers/127.36 miles) and will have a five-minute midway break at or near the conclusion of Lap 40. The Track: A 1.99-mile, 12-turn road course, Sonoma Raceway opened in 1968 as Sears Point International Raceway on 720 acres that was a dairy farm in the early 1900s. Since then then the facility has grown to 1,600 acres and hosts 340 days of racing activity each year. The Records: The series’ qualifying record was established on June 21, 2014 by Kyle Larson at 92.794 mph (77.203 seconds). The 64-lap race record was set on June 19, 2010 by Andrew Ranger at 69.155 mph (1 hour, 50 minutes, 30 seconds). Race Winners: There have been 18 different winners in the 38 races held all-time at Sonoma. Hershel McGriff (1983, 1985, 1987), Jim Insolo (1978, 1979, 1980) and Bill Schmitt (1981, 1988, 1989) lead the category with three wins each. Insolo is the only driver in series history to have won three straight races at Sonoma. Pole Winners: A total of 20 drivers have qualified on the pole at Sonoma. McGriff leads with three poles at Sonoma, while Butch Gilliland, Jim Bown, Roy Smith and Tim Williamson each have two poles at the road course. Cup Runneth Over: Non-series regulars have enjoyed success at Sonoma in recent history. Four of the last six winners at Sonoma have been scored by Monster Energy NASCAR Cup Series drivers, including Chase Elliott in last year’s event. Kyle Larson won the race in 2014, and Joey Logano and David Gilliland went back-to-back in 2011 and 2012. In 2010, Andrew Ranger won for the first time in the NASCAR K&N Pro Series West competition at Sonoma. A multi-time NASCAR Pinty’s Series champion, Ranger also won a series road course race at Utah in 2013. Familiar Turf: Will Rodgers could be primed for a breakthrough performance at Sonoma this weekend. The driver who comes from a road racing background sits fifth in the current K&N Pro Series West standings with four top fives in seven races this season. He made his series debut at Sonoma in this race last year, and his best finishes in 2016 came in consecutive races at Utah Motorsports Campus where he finished seventh, twice. Rodgers is a four-time Pirelli World Challenge Series winner and has several wins in Mazda spec automobiles. One And Done: Of the 14 races on the 2017 schedule, Sonoma marks the only road course race of the season for the NASCAR K&N Pro Series West. No current full-time driver in the series has won at Sonoma. The last to do so was David Mayhew in 2015. MADERA, CALIFORNIA (June 17, 2017) – The theme of Saturday night's round fours of the televised RPM Mortgage Pro Late Models and 51FIFTY Jr. Late Models was change. Change was in the air for a pair of second-generation drivers who rewarded their fathers with big Father's Day Weekend wins with Logan Zampa and Austin Herzog grabbing wins at Madera Speedway. For Zampa, the win marked his first career televised victory while Herzog, a four-time winner in 2016, broke the three-in-a-row Jr. LM streak of Jesse Love IV. 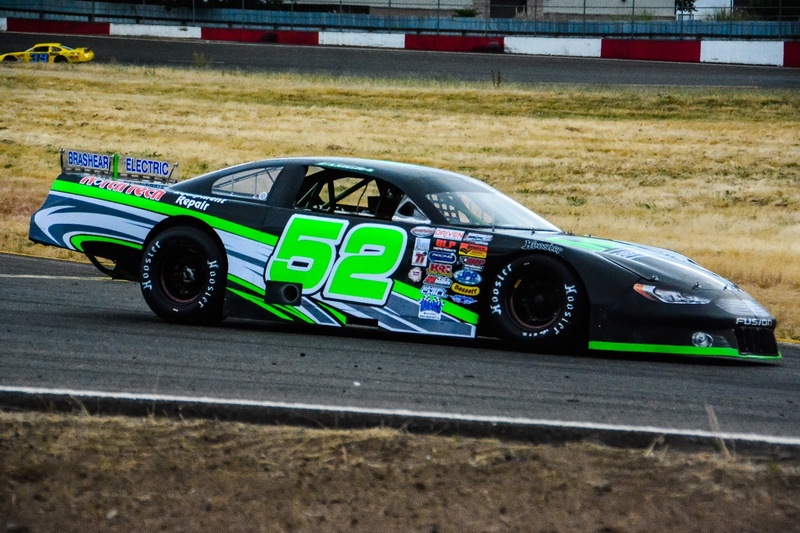 Zampa had finished on the podium multiple times this season along a few wins in the non-televised Madera Late Model series, and entered the night third in the RPM Mortgage Pro Late Model Series. 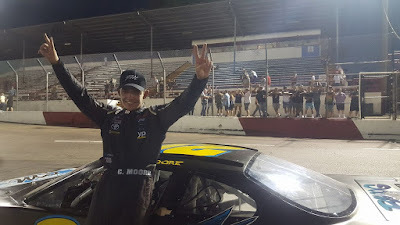 The Pro Late Model race was a 100 lap back-and-forth duel between Austin Herzog running double duty and 2015 champion Buddy Shepherd who himself had won two consecutive series races. Lengthy red flags within the first 12 laps for fluid from Thomas Suarez and Mark Squadrito slowed the action for the 25 car field considerably. Zampa spun in the fluid and went all the way to the back of the field, with his comeback earning him the Fluidyne Cool Move Under Pressure honors for the night. Kyle Gottula spun and Rick Thompson had hard contact with the wall with both cars out of the event on lap 12. Bakersfield's Racin Vernon again suffered mechanical woes to end his night on lap 28. The young Austin Herzog paced the first quarter of the race before Shepherd used the inside line to take over the lead. Coming out of the lap 50 break for adjustments and interviews with the MAVTV cameras, Del McIntosh fell out of the race with a swaybar mount problem while all-time winningest driver Matt Erickson, the 2016 champion, had a brake bleeder issue bounce him from the race on lap 78. Herzog kept up the intensity on Shepherd all the way into the final corner when the duo made contact causing Shepherd to spin. Several cars crashed including Ryan Hart hitting the wall significantly. Herzog scooted away to cross the finish line first but was penalized to the end of the lead lap for his involvement in the incident. Zampa was moved into the first position and celebrated a big victory that puts him squarely in the championship hunt. Modesto's Garland Tyler was second for another top three with Mariposa's Glen Cook third. Dillon Tucker and Howard Holden rounded out the top-five. On the 51FIFTY Energy Drink Jr. Late Model side, the season had been all about rookie driver Jesse Love IV with the 12 year old winning the first three races. But 2016 season runner-up Austin Herzog had different plans on Saturday night as he led all 75 laps in the feature. The talented field of drivers ages 10-16 years old was first narrowed down by a B Main event before 15 cars accepted the green flag for the feature. The feature was relatively fast-paced and incident free with Herzog leading from the pole position while the battling ensued behind him. One of the larger incidents of the night occurred on lap 43 when the #43 of Tyler Reif of Las Vegas hit the wall. While Herzog led the full distance with some challenges from Love, the overall battle was for second between Love and Eric Nascimento, Jr.
Love bounced off the front stretch wall coming to the finish for the second spot and missed out by a scant .087 seconds to Nascimento in a thrilling conclusion to the battle. Middleton, Idaho's Zachary Telford had his career best performance with a solid fourth place finish ahead of Las Vegas' RJ Smothermon. Kolby Berry once again set quick time but was unable to capitalize and finished seventh while B Main winner Kabe McClenny of Bakersfield drove through the pack for an eighth place finish. Nine lead lap cars served as a testament to the strong performance by these young drivers. The Modified Super Toyotas and Toyota Sedans entertained the crowd with a combined feature event with the faster MSTs won by points leader "Dirt" Bert Stephens while Jason Kearns won the Toyota Sedans portion with points leader Mike Marley in second. Madera Speedway goes dark June 24th before continuing July 1st for the BIG FIREWORKS SHOW! Grass Roots Racer Classic (Double Points all divisions including the Enduro Series), Madera Late Models, Race #5 of the Super Hobby Stock Series 50 laps, MSTs (48 lap main, split 24's) , Toyota Sedans (48 lap main, split 24's), F4's (24 lap main), Firecracker 40 lap Race #3 of the Enduro Extreme Series Barrel race & an Enduro Sprint Race (40 laps), and Jr. Late Model 25 lap exhibition race. ROSEVILLE, CALIFORNIA (June 17, 2017) - Cole Moore led 95 laps en route to his first career Pacific Challenge Series presented by PenneyLawyers.com victory on Saturday night at Roseville's All American Speedway. The hometown win for the Granite Bay driver came after a late race duel with 2014 series champion Mike Beeler of Modesto. Moore's win also makes him the fourth different first-time PCS winner through four races this year. Roseville's Shannon Mansch, a former PCS winner at the speedway herself, used a strong outside move to win the American Racer Tire dash worth $500 and the pole position for the 100 lap feature. Mansch took advantage of the position by leading the opening five laps of the contest. Cole Moore started outside pole and took a few laps to get going before he overhauled her for the lead. Sixth starting Beeler started moving forward when contact between three-time track champion Matt Scott and leading rookie Jack Wood on the front stretch bottled up the pack briefly. The first caution of the race flew when Elk Grove's Shane Butler had a right front flat tire. Beeler used the restart to pounce to the outside of Mansch for second on lap nine. 2015 PCS champion John Moore and Travis Milburn followed suit with Mansch getting hung out to fifth by lap 12. Smoke began trailing Mansch's #61 ride shortly after. When Galt's Matt Wendt stalled his borrowed backup car on the ramp for a lap 12 caution, Mansch retired to the pits in a frustrating end to a promising night. Scott started to make his moves towards the front as he got around Milburn for fourth on lap 18. Both John Moore and Scott used a lapped car to pick off Beeler for second and third respectively on lap 30. Moore and Scott quickly clawed towards the younger Cole Moore with the trio entertaining the crowd with a nose-to-tail battle. Scott nabbed second and turned his sights on Cole. On lap 55, the trio boiled over when John Moore tagged Scott in turn three sending him for a spin. Shane Butler came along late into the incident and made contact with Scott. All three cars were able to continue but with serious cosmetic damage. The fracas gave Cole Moore room to roam as he enjoyed a comfortable advantage. The final 20 laps however were a barn burner when Beeler started to turn up the wick and climbed up onto the rear bumper of Moore. As the pair jockeyed, Scott entered the fray with a three car lead pack over the remaining ten lap sprint to the finish. Beeler was unable to muster a race winning move and settled for a narrow second place finish as Cole Moore ripped underneath the checkered flag for his first career Pacific Challenge Series win. The top-five were Moore, Beeler, Scott, John Moore, and Randy Hedrick of Reno, NV. JR Courage ran as high as third before finishing sixth to win the Penney Racing Supply Hard Charger driving from 12th on the grid. The results end up netting a tie at the top of the points standings between Mike Beeler and John Moore as the two former champions head to one of their favorite races with the Firecracker 125/Ron Strmiska Memorial at Stockton 99 Speedway. Round #5 of the Pacific Challenge Series presented by PenneyLawyers.com takes place Saturday night July 1st!